So I built a board tonight, and its working (after removing and rotating one of the h-bridge chips I put on backwards). I’ve validated that micropython works on it, and I can turn on and off the four LEDs. I’ve also successfully paired my cell phone with the bluetooth module on the board, so I’m pretty happy about that. 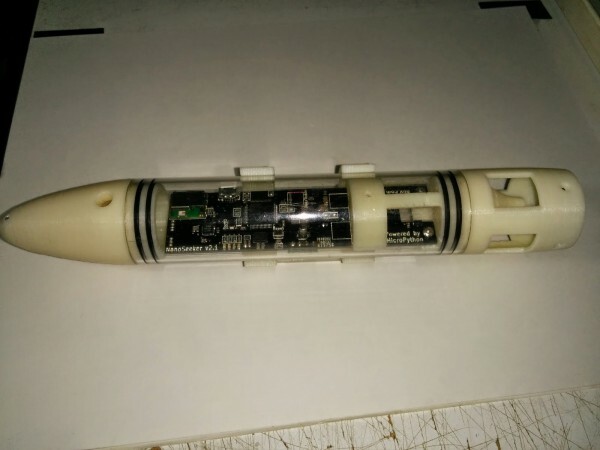 This entry was posted on Wednesday, October 22nd, 2014 at 9:00 pm	and is filed under DirtyPCBs.com, wireless. You can follow any responses to this entry through the RSS 2.0 feed. You can skip to the end and leave a response. Pinging is currently not allowed. I have to admit the engineering you performed is great. But, sorry for this, what is the added value of bluetooth for an under water vehicle? How deep/far from your phone will this work?